A satellite is scheduled to be launched this weekend which Iowa State University researchers say could bring a host of benefits to Iowans, especially farmers. 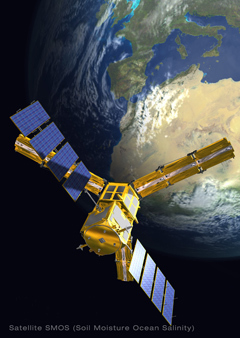 The orbiting device is called SMOS, for Soil Moisture and Ocean Salinity. Brian Hornbuckle, an I.S.U. agronomy professor, says the satellite’s sophisticated instruments will measure and map soil moisture levels globally every few days. Hornbuckle says, “The most direct application for the Iowa farmer is going to be potentially better weather forecasts and forecasts of climate which could also lead to forecasts of crop yield maybe months now in advance of harvest.” Since the satellite will be soaring around the planet at a fast clip while surveying the entire globe, the resolution will only be about the size of Story County, where I.S.U. is located. The ground measurements will be collected on some 200 acres of I.S.U. research farmland south of campus. The satellite is expected to generate global maps of soil moisture every two to three days for at least the next three years, which he says will have applications far beyond farming. Hornbuckle says, “SMOS is one more piece of the puzzle that will help us improve the forecasting of floods because if we know how soil moisture varies on the landscape, we have an idea of how much of that precipitation is going to soak in and how much is going to run off and cause flooding.” The satellite is due to be launched at 7:50 P.M./Central time on Sunday by the European Space Agency. America’s space agency, NASA, is planning for a similar type of mission in 2014 which Hornbuckle says will provide even a more active role to researchers at Iowa State.